Mechanical design and as built drawing issue, material procurement, fabrication, non destructive testing, sandblasting/painting, certification, transport/delivery of equipment at MOH Premises. 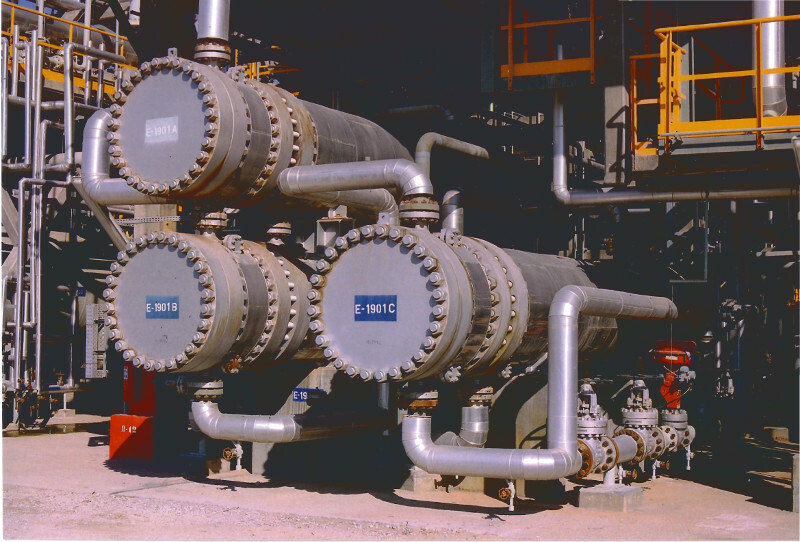 Mechanical Calculation, Construction drawings, Material Procurement, Manufacturing, NDT and Hydrotest, Sandblasting and painting of 22 Slow Pressure Vessels and 2 Heat Exchangers, which will be installed in Algeria for SONATRACH in the two sites of TIDIKELT and Sbaa. Mechanical Design of 5 stainless steel heat exchangers Steam- Nitrogen and Water-Nitrogen. Mechanical design, as built drawings issue, material procurement, fabrication, non destructive testing, sandblasting/painting, certification, transport/delivery of equipment at Hel.Pe. Premises. S&T C.S. Heat Exchangers _S.R.U. S&T C.S. Heat Exchangers _V.D.U. Mechanical design and as built drawing issue, material procurement, fabrication, non destructive testing, sandblasting/painting, CE certification, transport/delivery of equipment at Hel.Pe. Premises and submission of Inspection Book. esign, material procurement, fabrication, sandblasting-painting, certification, transportation of 2 H.E. (E-8, E-9) and 1 vessel (100-V-06). Supply of materials, design (thermal/hydraulic & mechanical), fabrication, inspection, testing, painting, preparation and delivery of one S&T H.E. E1909_Hot Separator Cold Separator Liquid. Supply of materials, design (mechanical), fabrication, inspection, testing, painting and delivery of one S&T H.E. Design, engineering, material supply, fabrication, testing and delivery to Hel.Pe. Elefsis. Thermomechanical design and detailed engineering. Supply and delivery of materials (except from tubes that are being supplied by HELPE). Plates cutting, tubesheet and buffles drilling, tubes assembling-welding-bending. Bundle assembly. Tubes expansion. Plates rolling. Channel stainless weld overlay. Prefabrication and installation of nozzles. External supports installation. Assembly of heat exchanger. Non destructive test. Hydrostatic test. Sandblasting and painting. Delivery of equipment at HELPE. Third party inspection body certification. 3-E-7C/D_Crude Oil VS Hot Atmospheric Residue. Material procurement (plates, forgings, tubes, flanges, pipes, gaskets). Mechanical calculations, as built drawings. Fabrication of the three heat exchangers. Non destructive tests. Sandblasting - painting. Delivery to Hel.Pe. Refinery, Aspropyrgos. Thermal and static calculations of the 4 kind of H.E., material procurement, fabrication of 7 H.E., N.D.T., 'CE' marking, transportation and delivery to Thessaloniki Refinery. Heat Exchanger : Μ-3201A/B/C – Type BEU TEMA Horizontal – Cold combined h.e. Detailed engineering, fabrication and non destructive testing has been performed under ASME VIII Div. 1, TEMA 'R' & EXXON Basic Practices codes.